Coming to Reinhart Auditorium next Tuesday, be sure to catch the MHS Choirs' Fall Concert! This concert will feature music from Broadway musicals and will include performances from all five choirs, in addition to solos, small ensembles, and two special performances by the participants in our summer choir camp! Tickets will be sold at the door and are $5 for adults and $4 for students & seniors. Doors open at 7:00 PM and the show starts at 7:30. Don't miss the first public show of the 2004-2005 choral department season. 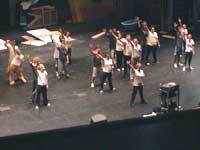 Find out more about the Fall 2004 concert, including a tentative list of music to be performed. Our spring concert, Only in America, will be presented May 20th at 7:30 PM in Reinhart Auditorium. Tickets cost $5 for adults, $4 for students, or $20 for a "family pass." An official concert program and some rehearsal photos will be posted in a few days. Don't miss this exciting show, which will be the final public choir performance for the class of 2004!